Going to events in and around Frankfurt has given me the opportunity to meet many new people. I recently attended American Citizens Information Night and besides the abundant supply of American goodies like bagels and Mountain Dew, I met a lot of friendly, open and kind expats. There is just something very wonderful about the immediate comfort you get from a fellow expat when you know you can speak English really quickly and they will still understand all your subtle jokes and innuendos. As luck would have it, I got the chance to bake for one of those lovely people I met that night. 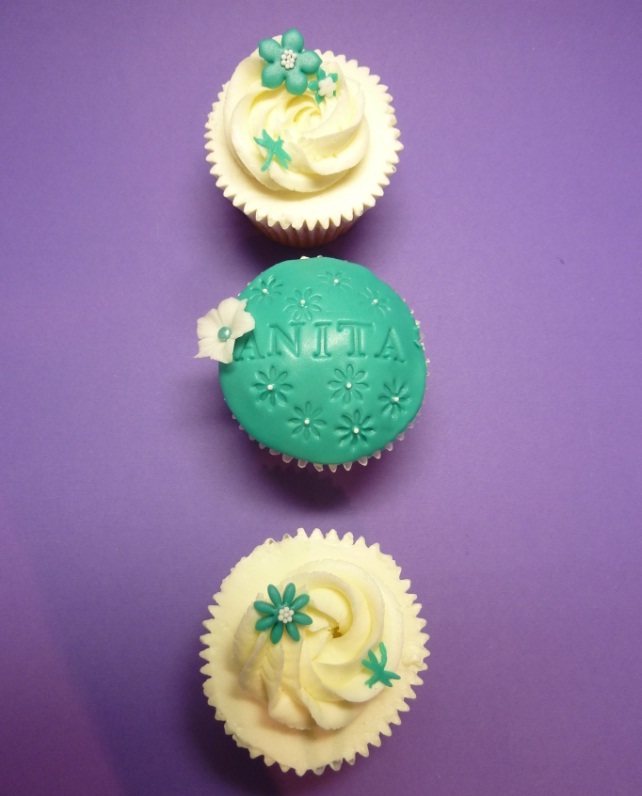 Anita is an avid fan of cupcakes, an expat like me and also understands the etiquette when it comes to providing cake on your own birthday. So she requested my help to sweeten up her colleagues in the form of 1 dozen French vanilla cupcakes and 1 dozen Belgian chocolate cupcakes. She is a big chocolate lover, so I obliged by using my best chocolate cocoa. Her favourite colours include teal, blues and greens so I used those colours as accents. I decided to include one cupcake blanketed fully in fondant as a bit of an ode to hello naomi who is a big inspiration to me. 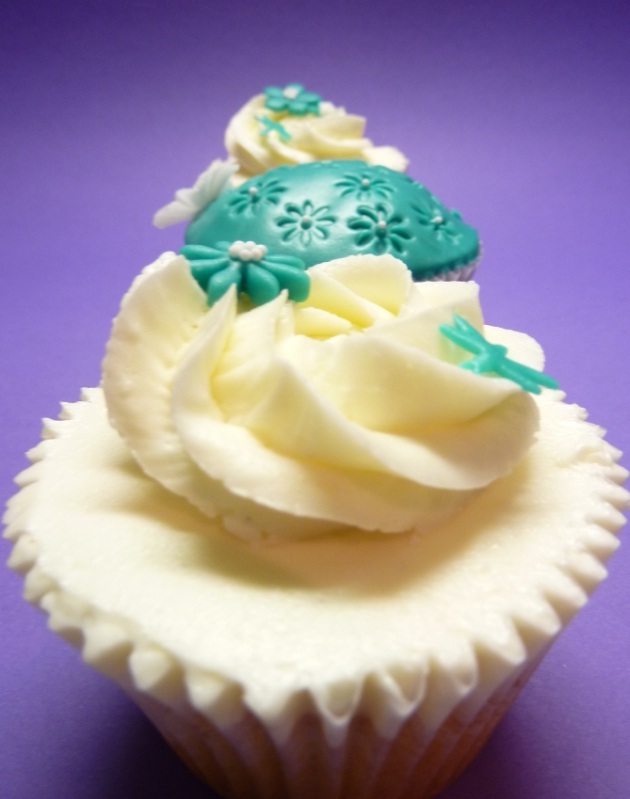 There is something very clean and professional about a cupcake with a fondant finish. I do try to keep fondant to a minimum, but I have seen this fondant covering done many times and I thought it was about time, I try it for myself. With these fondant-blanketed cupcakes, there are different methods, however the one I used includes a buttercream layer under the fondant blanket. So if you are not a fan of the fondant, you can simply peel it off and you still have your normal cupcake with buttercream frosting to bite into. For a good how-to tutorial, visit CakeJournal. Word of warning, use recipes that guarantee you a nice domed cupcake. The key to adding a fondant top, is to have a domed top to begin with. If you don’t have a domed cupcake and instead just create the dome out of buttercream, when/if the buttercream melts, your fondant will lose its shape as it will have no dome to hang onto and could slide off into a gooey mess. The ‚full fondant blanket‘ over a cupcake is very popular across the globe, in countries such as Australia, New Zealand and the UK, however interestingly enough, I recently heard that in America, cupcakes are taking a new direction in becoming more healthy ─with more vegan cupcakes for example. Highlighting this point, a vegan chef recently won the $10,000 prize on Cupcake Wars showing that traditional ingredients could be on the way out. Healthier options such as apple sauce, coconut milk and agave nectar are substituting traditionally used items such as butter, milk and refined sugar. Personally I like to get the best of both worlds and that is why I try to achieve a balance in my cupcakes. I love the beauty and sophistication of fondant covered cupcakes but can appreciate that it should be kept to a minimum and that cupcakes don’t need to overwhelmed with sugar. This is why I chose to do this single cupcake as an accent so that the details of fondant art can be aesthetically inspiring and not sugar-overload off-putting. We shall see what the response will be like from the Germans as I introduce them to the world of fondant. The cupcakes themselves turned out beautifully with the extra special chocolate cocoa powder and needless to say, chocolate cravings were satisfied, yet more German cupcake addicts were born and all was right in the world. have you experimented with the vegan/healthier option yet? Love you fondant topping btw, tre kool! The cupcakes Ewa made for my birthday were the most beautiful and delicious I’ve ever had. And my German colleagues used phrases like „verdammt gut“ and „mmmmmm, lecker“ to describe them, both expressions of high praise and satisfaction. 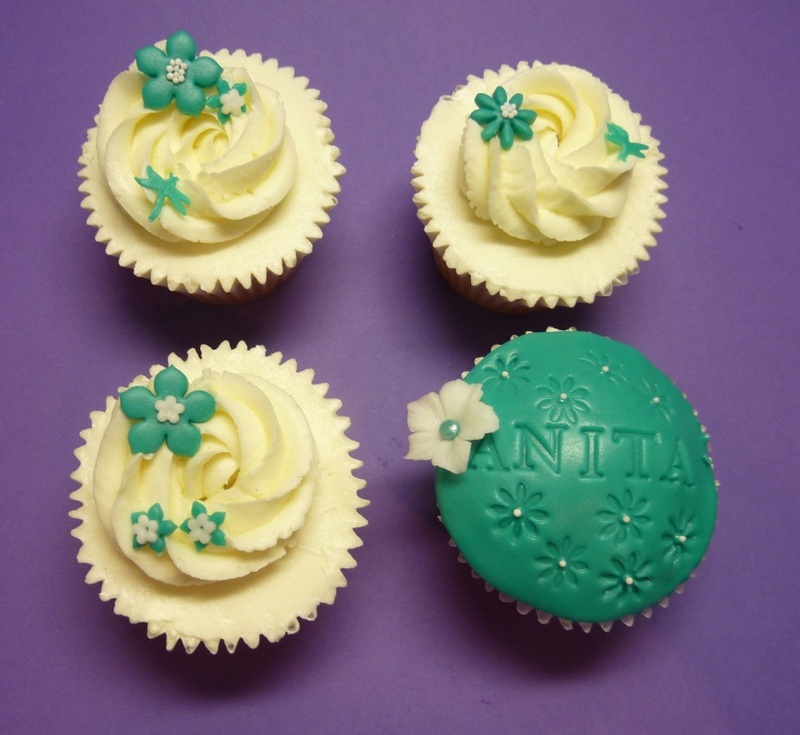 And the cool fondant with my name on it was also very practical–everyone knew which one was mine. ;-)So, thank you, Ewa! Your cupcakes are gorgeous on all the posts! Seriously, your blog is truly inspirational. I will definately be following your posts. 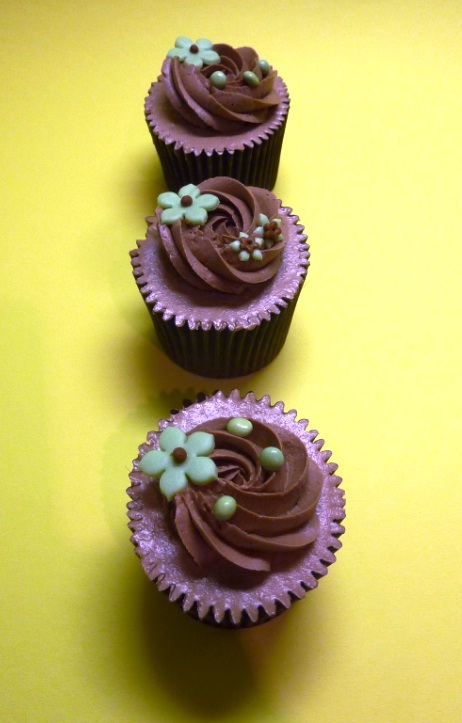 I am wanting to experiment with unique different flavour combinations for cupcakes, any suggestions would be appreciated. I have really been looking to try out the red velvet and cream cheese frosting recipe. This recipe looks like a winner. Thank you for reply, so lovely to receive such warm help. Speaking of suppliers, where do you get your cake boxes from, the ones with inserts? Im finding them to be quite pricey! I’m happy with my vanilla and chocolate recipe and my carrot cake recipe from Pastry Queen is very similar to yours! I will have a look at your link for red velvet and will give it a try, havent yet tried it yet! 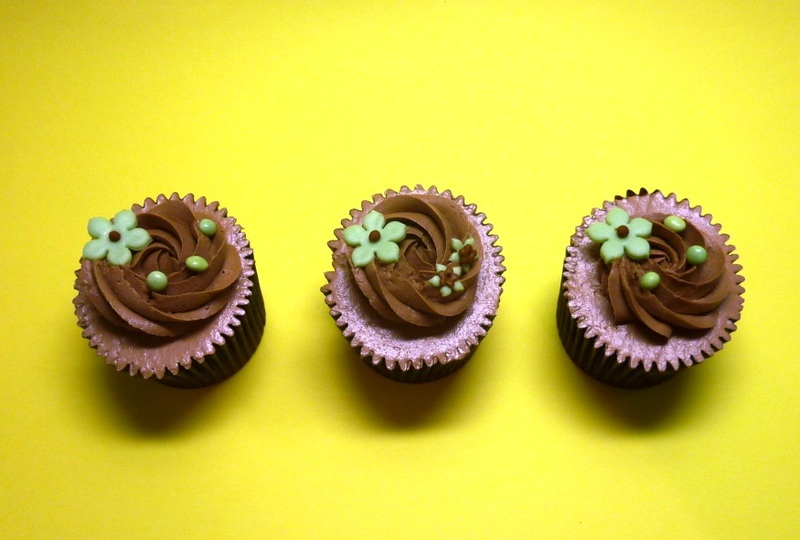 Have you got a good lime and coconut/ mocha cupcake recipe?